IVR Simulation and ACD Simulation Inbound Phone Applications using Call Center Simulator with Voice Broadcast Simulation and Auto Dialer and Predictive Dialer Simulation. Our ACD system with Interactive Voice Response (IVR) processes inbound phone calls, plays recorded messages including information extracted from databases and the internet. It can then route calls to either in-house service agents or transfer the caller to an outside extension. It enhances our phone system's current robust features of predictive dialing, ACD, and digital call recording. Our IVR model and ACD simulation program is a resource calculator. The IVR model calculates resource requirements for an inbound phone campaign. It estimates the number of lines required to handle peak load processing of these calls. 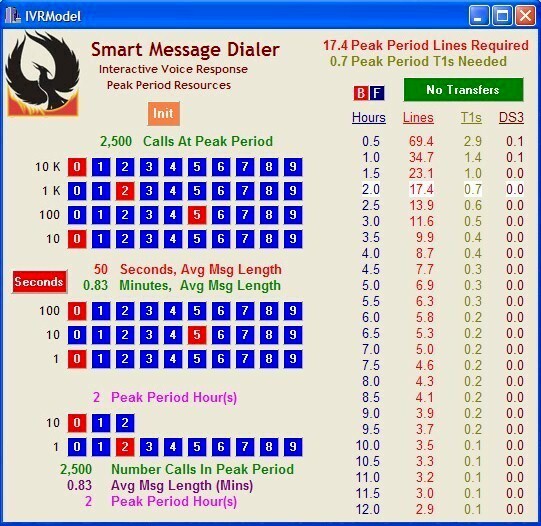 This model assumes that calls are evenly distributed during the peak period. To obtain sample calculation of your IVR phone system requirements, please fill out our contact form for Call Center Simulation web page. The following is sample of the IVR simulator and the results of this calculation. Average Call Length (Seconds) - This is the estimated time spent by a caller in your IVR system. The more complex an IVR program, the more difficult it will be to make this estimate, especially if your IVR routes callers to inside call agents or transfers the call to an outside line. - This parameter is used in conjunction with the next parameter (Peak # of hours). It is the total number of calls expected to be received by your IVR phone system during the Peak hours. For example, if your peak call period is between 9AM and 11AM and you expect to receive 2500 calls during that period, this parameter would be set to 2500 and the next parameter would be set to 2 hours. Peak Call Time Period (Hours) - Time period during the day (in hours) when you expect to receive the most calls. (Used with prior parameter). The display above indicates that to process the number of calls specified in the input parameters would require 17.4 phone lines (upper right hand part of display). Also provided is a table of line requirements based upon a shorter or longer peak time period during which the number of peak calls would be received. These results would indicate that a single T1 system (with 24 lines) or an analog phone system supporting 16 or 24 lines would be required to handle this call volume. Organizations looking to reduce costs and to improve customer service can now contract their inbound phone and outbound voice messaging programs at our IVR call center. As designers of Interactive Voice Response IVR systems and IVR software, Database Systems Corp. (DSC) is uniquely positioned to manage your hosted IVR services and 800# service campaigns saving your company both time and money. Because our IVR outsourcing system was created in-house, we can deliver comprehensive IVR outsourcing services quickly -- providing you with a competitive advantage in the marketplace. Plus you will find our inbound telemarketing services to be quite affordable at our IVR service bureau. Contact DSC to learn more about our IVR services.